Are you interested or involved in air traffic control equipment? 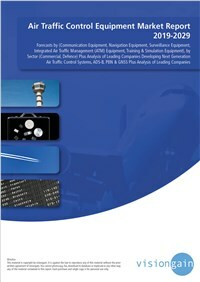 The key player has produced an in-depth market research report on the air traffic control equipment market. A variety of submarkets are covered, whilst forecasts of leading regional and national markets offers you insights into region-specific opportunities and developments. The key player calculates that this market will be worth $4.6bn in 2019. See extensive contracts tables of regional Air Traffic Control Equipment programmes. Detailed forecasts can be used to help develop your business plans and strategy. With a Visiongain report, the reader is able to see a clear overview of a market. Our market evaluations will help your company when considering the air traffic control equipment market. With a total length of 271 pages, and 154 tables and charts, this report offers an overview of the air traffic control equipment market.